1. Why a Super Bright LEDs Light Bar? 3. Do I need a wiring harness? 4. What is the difference between ATP and DT connectors? 5. Can I run my Light Bar from a wall outlet? 6. Why does my light bar draw less wattage than the wattage in the title? 7. What is the difference between raw and effective lumens? 8. Can I dim this light bar? 9. What is the difference between Multi-Beam and Combo Beam? Do I need a spot beam or flood beam for my application? 10. What makes a light bar a light bar? 11. What is IP Rating (Ingress Protection Rating)? 12. Do I need solid/black covers for my light bar lens? 13. What is the distance between mounting holes? How long are the wire leads that come from the light bar? What size bolts are used in mounting this light bar? 14. Where can I find mounting brackets for my vehicle? Why a Super Bright LEDs Light Bar? Every light that carries the Super Bright LEDs name must meet strict quality standards. Our fully-equipped in-house test lab uses the latest equipment necessary for photometric/electrical testing, long-term lumen maintenance testing, and stress-testing for environmental conditions to ensure our customers receive the highest quality products. Real world use of off-road lights can be brutal. To see just how our lights will respond in the most extreme conditions, and for a little fun, we use assault testing methods to make sure the lights you buy will hold up to the most abusive punishments. Through drilling, cutting, freezing, dropping, crushing, and burning, our lights not only hold up, but continue to operate. These tests have generated such exceptional performance in these products, that we confidently back them with a Lifetime Warranty. Do I need a wiring harness? The harness is fitted with a relay to insure proper load switching is available for our light bars and work lights. The relay is designed to take the current load instead of feeding the full current to the dash switch. It is also replaceable, so you do not have to replace the harness if the relay fails. The harness has a in-line fuse holder, to protect the vehicle's circuits. The harness comes with direct connectors matching our light bars, negating the need for using the pigtails and weather proofing the connections. The harness has low current switches to reduce the foot print on the dash of the vehicle. The gauge of wire needed for a low current switch also allows for easier routing. The switch wiring has a disconnect to make installation easy. For more detailed instructions on how to wire your light bar or work light, see our Installation Instructions section. What is the difference between ATP and DT connectors? ATP connectors are designed to handle a larger current draw when required. DT connectors are designed for lower current draw light bars and work lights. Can I run my Light Bar from a wall outlet? No, our bars are designed to be used with low voltage DC systems and require the proper voltage and current levels to operate correctly. Connecting the lights to any other power source may not work and will void the warranty. Stationary setups are not recommended due to the high power design of the LED light requiring air flow across the heat sink to properly dissipate heat and will void the warranty. Why does my light bar draw less wattage than the wattage in the title? The light bars are capable of using the wattage listed in the title. However, doing so would result in shorter life span, much like constantly driving your vehicle with the accelerator to the floor would shorten the life of your engine. There is a balance between LED wattage and LED lifespan; other components, such as the heatsink, allow for maximum operating efficiency and light output, while prolonging life expectancy. Driving the light bar at a lower wattage will also cause a difference between raw lumens and effective lumens. What is the difference between raw and effective lumens? Can I dim this light bar? 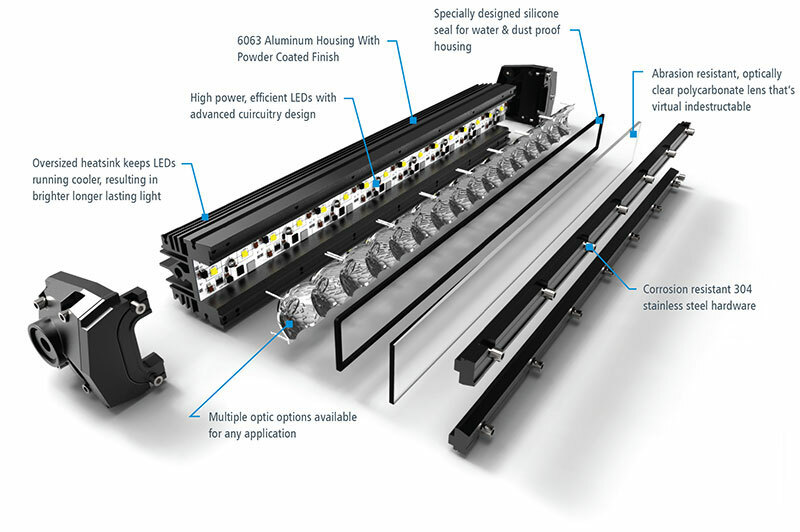 No, our light bars are designed to operate in a wide voltage range but not designed to be dimmed. Attempting to do so could damage the driver and void the warranty. What is the difference between Multi-Beam and Combo Beam? Do I need a spot beam or flood beam for my application? What makes a light bar a light bar? What is IP Rating (Ingress Protection Rating)? The IP Rating is the protection of electrical equipment in a given environment. All of our off-road light bars, work lights, and mini-aux's are waterproof IP67 or IP68 rated. The higher the numbers, the greater the level of protection. Do I need solid/black covers for my light bar lens? Depending on your local and state laws you may want to choose a light bar with optional covers. Light color can also be modified with optional covers. Our light bars are extremely durable and can stand up to the harshest of conditions. However, some laws require light bars to be covered when not in an off road setting. Check your local and state laws before ordering. What is the distance between mounting holes? How long are the wire leads that come from the light bar? What size bolts are used in mounting this light bar? Every one of our light bars has a detailed specification drawing to help you find the perfect bar for your application. Simply click the specifications tab on the product page and scroll down to find the specification drawing for each product. Where can I find mounting brackets for my vehicle? All of our light bars come with standard universal mounting hardware included. For specific applications, we offer a wide array of additional mounting options for our light bars to fit most applications: ATV/UTV brackets, universal roll bar, brush guard, and bumper mounts, and even vehicle specific mounting options for the best mounting solutions. Check out our Light Bar Installation Guide Page for instructions on how to mount any of our light bars or work lights.